Stephenie Meyer, for those of you who don’t know (which is probably a minuscule proportion of you) is the author of the massively popular twilight saga (twilight, new moon, eclipse, breaking dawn). This is her new novel (well, newest. It was published in 2008). A “science fiction for people who don’t like science fiction”. It isn’t science fiction, it’s romance. You could class it in science fiction as there are aliens that climb into your body and control your mind, but that’s not what the plot revolves around. It’s really all about the weird love triangle/square – as Wanda and Melanie are one person and two people at the same time – and how they deal with the situation. And it’s actually really good. Not absolutely epic and amazing, but it’s really interesting and a great read, especially after having low expectations from twilight (which I don’t hate, but I don’t love either. We’ll cover that in another review). Wanderer (Wanda) is a soul: an alien that will take over human’s bodies and wipe out their consciousness. But Melanie, Wanderer’s host, will not fade away. She bombards Wanderer with images of Jared, the man she loves, and together they journey out, searching for the man and a rebelling group of surviving humans, who hate the souls. When Ian was all madly possessive over Wanda (when he didn’t let anyone else hold her jar-thing when they were looking for a new body for her, or when he was carrying her and running and shouting at her when she planned on dying), I know it’s meant to be sweet, and on weird some level it is, but it is also – admittedly – creepy. I found it scary in a way, how possessive he was of her. Though I do like Ian and his character overall. I loved his development throughout the book, from hating Wanda because she was different and trying to strangle her, to being forced not to kill her by Jeb, and then protecting her from Kyle and Jared when she was nearly attacked. It was a lot more interesting to read about a likeable character that is still flawed. Though I do feel that he did become a bit too perfect near the end, though that’s only a tiny problem that I can deal with. I do have a bit of a problem with Jared. I understand that he’s so in love with Melanie, so he really hates Wanda, but I did not like him. He beat up a poor girl/alien who turned her back on her entire species and risked her life for a man she didn’t even know and another human girl she hated. And even if he didn’t know that, we the readers did, so when he punches her it’s like a neon sign flashed over his head saying “BULLY”, “ENEMY”, or some other bad word that I shouldn’t use. (We have to keep it PG here at Discombobulated Books.) And Melanie does say that it’s only because Jared’s so in love that he’s doing these stupid things, but it really doesn’t help that Melanie becomes SO FREAKING ANNOYING whenever Jared is around. Melanie, on her own, is a great character. She’s strong, loyal, funny but also stubborn and sometimes blinded by her determination. Her and Wanda’s conversations are interesting to read. But when Jared is there this is what her thoughts are. All the time. Seriously. “Jared’s here, Jared’s alive, Jared’s here. 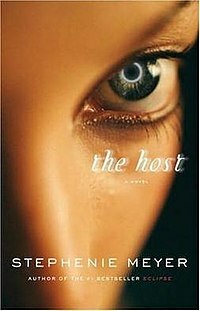 She was incoherent, chanting the words like they were the lyrics to a song.” – The Host, pg 130. Which is not fun to read. Good for her, for finding the love of her life. And that doesn’t seem to bad, except this goes on over and over and over again for the next large portion of the book. She’s so illogical and in love that she seems to become such a weak character. There’s probably a message in there about how love changes you and stuff, but it’s like listening to a five year old who wants candy. But it wasn’t that bad comparatively to other YA Fiction. But yes, very mushy. Of course, there was also one little thing they mentioned when they were deciding what to do with Wanda/Melanie. There’s this bit where they talk about how it’s “Jared’s property” or “Jared’s body” or something. Basically saying, Jared’s her boyfriend so she is his property. And then Jamie comes along and is like “No wait! I get a choice too!” Because he’s her little brother, so I guess she’s his property as well. And maybe I’m reading to far into it, but I thought it seemed wrong. I understand that they should have more of a say than others but did Jeb really have to say something along the lines of “This body belongs to you, Jared. You get to decide whether we slaughter her or welcome her with bread and cupcakes.” (paraphrased, of course). No one owns Melanie. No one has a right over her body just because she’s dating them or related to them. She’s not anyone’s property, and saying that they have a right over her is stupid. Oh, and Stephenie Meyer’s writing style. It’s not that it bothers me enough to not read it, it’s just that her descriptions are so long-winded and abundant. It seems like each piece of dialogue has at least a sentence of lengthy description with it, and there are huge sections of description or mental contemplation about life. It’s fine to read through, but sometimes I found myself skimming through all the description by accident, and having to go back and reread it. In general, good plot, good pacing and really good character development. None of them really stood out to me, but none of them fell short. Apart from some of the problems I had with some of the main characters, the rest were all good. I loved Jeb; I thought he was such a likeable and easy-to-relate-to character. I did also like Wanda and Melanie (when she wasn’t having her lovey-dovey Jared phases), they both had flaws (which is nice to see that an author is making an effort not to have a perfect character) and they’re developing relationship – from hating each other to basically becoming sisters – was great to see. Now, to be honest, this isn’t a very quotable book, by my standards. Apart from all the very gooey love proclamations, there isn’t much else. But here my favourite parts are. All t0 do with Kyle, for some reason, probably because only the vaguely funny things happen with him. The rest is all supposed to be intense and romantic and dramatic and stuff. “Jared lunged forward, away from me. With a loud smacking sound, his fist hit Kyle’s face. Kyle’s eyes rolled back in his head, and his mouth fell slack. The room was very quiet for a few seconds. ‘But I feel better,’ Jared answered, sullen. So, it was a really good read. It wasn’t one of those heart-pounding and captivating books where you can’t turn the page fast enough to find out what’s happening and you stay up until 4am trying to finish it. This was one of those quite interesting reads where you weren’t dying to know what was going to happen, and could set it down for a few days without going crazy, but keep going back to it to find out what happens next. This book gets 3 1/2 out of 5 stars. It was good, certainly not perfect, but definitely not bad. I would recommend it, but more for people who prefer the whole character driven development with interesting plot ideas and no hatred of love triangles/squares.